It is very interesting that Summorum Pontificum was issued on 7/7/7, or in European dating, 7/7/7. Three is the superlative in Biblical terms for anything in heaven or on earth, so three sevens means “covenant to the utmost.” Interestingly enough, we have seven sacraments. But this number goes even deeper into tradition: In Hebrew, to “seven” someone is to covenant them, to enter into a life-for-a-life relationship. This is done by “cutting a covenant” as the Hebrew for “covenant” takes the verb “to cut.” For example, God first “cut a covenant” with Abraham by cutting apart two animals and two birds (Gen 15) and passing through them. He would turn this violence on Himself 2000 years later on the Cross and in the Holy Mass, for “the priest sunders with unbloody cut the body and blood of the Lord, using his voice as a sword.”—St. Gregory Nazienzen. This is not Calvinism or even the Father turning against the Son. It is the Divine Word as God offering his sacred humanity in body and in blood through the pain and love of the cross to each one of us. Some priests before Vatican II used to go off to Mass saying that they were going to do “holy violence to God.” Why? Because Jesus gives His body and blood to us from the most unkind cuts of Calvary, perpetuated in the Mass. Was it any accident that the most ancient form of the Roman Mass was re-opened (albeit never fully abrogated) on the 7th day of the 7th month of 2007? God establishes a worldwide covenant with His people. Strangely, Pope Benedict never offered the extraordinary form in public. On the other hand, Pope Benedict XVI called the ordinary form “a banal, on-the-spot-fabrication.” How then, did he expect the old rites and new rites to be streamlined together in a single parish? 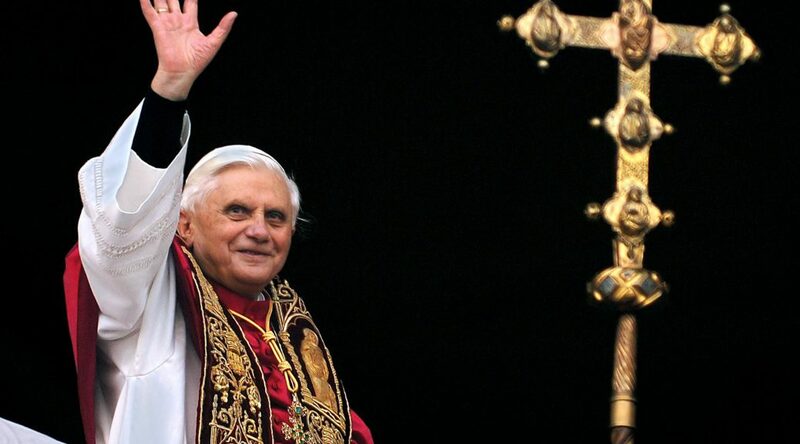 Pope Benedict proposed “the hermeneutic of continuity.” The hermeneutic of continuity holds that there is to be no rupture in liturgy (or doctrine) before the Council or after the Council. I believe that this was the number one goal of his papacy and Summorum Pontificum. Has it worked? At least one bishop this year has repealed Summorum Pontficum by stating that “Masses are not to be celebrated using the Extraordinary Form without my permission” as seen in this article. The new Mass is rarely permitted by bishops to be celebrated according to even post-Vatican-II rules. If you think this is an exaggeration, consider the 2004 document signed by Pope John Paul II and written by Cardinal Arinze, titled Redemptionis Sacramentum. In this document, it is clear that the new Mass can be done ad orientem (facing the altar.) Latin is permitted (yes, in the Mass of Vatican II) and pastors were encouraged to effect an enormous reduction of Extraordinary “Ministers” of Holy Communion. Pastors were permitted to eradicate reception of Holy Communion in the hand. Free-floating chalices were to be retracted anytime the Most Precious Blood of Jesus could be spilled. All of this is in Redemptionis Sacramentum, an official post-Vatican II document giving guidelines for the Mass of Paul VI. But ad orientem worship was prohibited this past year as a clamp-down against Cardinal Sarah’s call for ad orientem Novus Ordo Masses (an echo of his African predecessor, Cardinal Arinze who wrote RS.) The few priests who try to do the new Mass according to its own rules are sent to the boondocks of their diocese. Priests who preach the truth of the Gospel are more and more frequently going into exile like this courageous priest from San Diego. On this one point I agree with the theology of Bergoglio more than the theology of Ratzinger: There is no hermeneutic of continuity after Vatican II. The former has not said so specifically, but that is clearly his message in every conference, every week. Ratizinger’s envisioned “hermeneutic of continuity” was that the traditional doctrine, life and liturgy of Catholics would eventually make peace with, say, the progressive Cardinals of Northern Europe. Benedict tried to win them to his mild form of orthodoxy. How did they respond? They did something so mysterious that Dutch radio reported “that Ratzinger resigned because of” Cardinal Danneels and his friends. Benedict apparently denies this: 1 However, he looks strangely tired in every picture I see of him. Is he just old? Perhaps, but he actually looks disoriented, which I think is suspicious. Before he gave up the battle, his eyes seemed to say: “I am for peace, but when I speak, they are for war.”—Psalm 119/120. Even if I am wrong about my above speculations, most people agree that the days of feigned peace between traditional liturgy and wacky doctrines are long gone. Many men in power are now promoting a Hegelian dialectic where the “spirit” changes with human authority. The new Mass is no longer controlled through the lens of Church History, but through a nominalism condemned in Pope Benedict’s 2006 Regensburg address against Islam. Nominalism means authority can function in a manner willy-nilly: For example, the Vatican may or may not be currently in the works of fabricating an “Ecumenical Rite of Mass” for joint worship with Protestants. Or, consider how random it is that priests in Rome are being admonished to abandon daily Mass in favor of group concelebration. The few young priests who shield their conscience in choosing the 1962 sacraments (as allowed by Summorum Pontificum) face a harsher punishment: Just two weeks ago, a bishop asked his own priest (who I know very well!) to leave the priesthood and be “laicized.” Look: Bishops don’t even ask priests caught in homosexual relationships to be “laicized.” This is additional proof that there is something more than natural attack (read: preternatural attack) coming against Summorum Pontificium and the 1962 sacraments. Summorum Pontificum colliding with the current circus maximus of Rome actually creates a fork in the road where there is no more grey zone, no more sitting on the fence. Finally, America’s smiley seminarians will have to man-up and choose either the living tradition of Divine Revelation or an ecumenical concelebration ad absurdum. The latter is possible, considering that progressive prelates are tolerant of everything except the hermeneutic of continuity. If I am right on this, then this means that Summorum Pontificum is currently the only road back to tradition. It is a road fraught with thorns and priestly betrayal. Such is the glory of the cross.